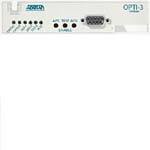 The OPTI-3 Controller Module (OCM) provides an OC-3 interface to the network and three ADD/DROP DS3 interfaces to the Loop. The OCM can be configured for a point-to-point configuration or subtended from 3rd party SONET equipment. The OCM operates in terminal mode only.